We may still be waiting for actual news through the gaming press, but in the meantime an interview with Sengoku Basara series producer Kobayashi Hiroyuki was recently published in the digital edition of the Asahi Shimbun newspaper. 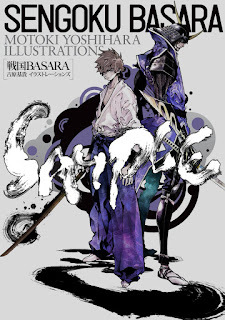 Much of the interview covers information we already know since they talk about incidents dating back to the creation of the very first Sengoku Basara. It's nice to look back a little right before the promotion begins for the newest game, right? When KobaP and YamamotoD were first working on the game, they wanted to make a title with distinctive characters - like those in the Street Fighter series. Back at the start, there weren't any staff members working on the game who were especially familiar with the Sengoku period. KobaP joked that they didn't let it worry them and kept going anyway. Still, even though they wanted the game to be quite crazy they set out some basic rules to ensure that they kept to the historical setting. Although one of these rules was that they wouldn't take the series into outer space, there ended up being things like laser beams coming from the sky. Another rule was that they wouldn't shift the focus of the story overseas; there are often requests for famous foreign characters to appear but they want to keep the game based around Japan. Xavi is an original character with no relationship to Francis Xavier. (Raindrops' note: We all believe you, KobaP). Back when they were making the first Sengoku Basara they thought long and hard about whether to include blood. KobaP has also worked on the Biohazard (Resident Evil) series which incorporates a lot of bloodshed but he wanted Sengoku Basara to use light and sound effects to thrill the player when they made an attack instead. He hoped that it would broaden the series' appeal and mean that even small children and elderly people could enjoy the games. On the topic of why they picked Date Masamune and Sanada Yukimura as the leads, KobaP explained that they were both popular historical figures (though Yukimura didn't have the same widespread name recognition a decade ago that he does now). They came up with a setting where these two warriors from a younger generation would be setting their sights on unifying the nation with Oda Nobunaga as the 'final boss'. The veterans such as Takeda Shingen and Uesugi Kenshin would then be having their own confrontations too. They thought that the formula might appeal to fans of shounen manga. Some elements, such as Yukimura serving Shingen, aren't accurate since in reality the characters were active at different points in history. The team deliberately overlooked the timing issues and treated it as a 'what if' scenario. They thought they could make it into something like a 'Sengoku Dream Team All Stars'. KobaP joked that he'd like to end the trend of angry mothers blaming them when students get confused and write the wrong answers in exams. He hopes that Sengoku Basara can inspire people to study the real version of history. Yukimura is relatively popular. KobaP thinks there are a number of reasons for this ranging from his hot-blooded 'hero' image, which contrasts with Masamune's cool attittude, to his straightforward, tenacious personality. The older female fans probably think he's rather sweet, too. They're often asked to organise another ranking and always decline; messing with the characters' images by releasing an official ranking isn't viewed as a good thing. On the subject of Yukimura's appeal, the real Sanada Clan had a dramatic history with links to various other warriors. Even setting this aside, the family was split across western and eastern factions which set brother against brother (and father). Then there's the phrase The Greatest Warrior of Japan ('Nippon Ichi no Tsuwamono') which is associated with Yukimura, and the trouble he gave Ieyasu at the Siege of Osaka. As with the Hanshin Tigers (a famously unlucky baseball team from Kansai), perhaps there's something about being the loser that makes people want to cheer for you. The interviewer remarked that Yukimura is handsome in Sengoku Basara while the actual historical figure was said to be grizzled with missing teeth. KobaP simply responded that games are just like movies and television dramas. It's good to see a cool guy in a fierce fighting stance; don't male and female viewers alike enjoy seeing people like Tom Cruise and Keanu Reeves clinging on in dangerous situations? Even if someone has an amazing lifestyle, if they don't look good people won't be interested. This doesn't just affect Yukimura. They portray fresh, cool characters to expand the series' appeal. The interviewer remarked on the popularity of anthropomorphism in recent manga and games with countries, trains and battleships all showing up in human form. Sengoku Basara is a little different in that the characters are all actual people, yet each of them has a strong sense of individuality. KobaP thinks that basing the characters on famous warriors gives them extra importance. For example, if they called Date Masamune 'Blue Dragon', gave him six katana and had him speak English, he'd just be a regular game character and might be overlooked. Having him represent Date Masamune pulls people in and makes them wonder about him. While the game is mostly aimed at people in their mid-twenties, it's played by teens through to fans in their forties. Many of the male players enjoy the gameplay, while the female players tend to be drawn in by the characters and stories. The interviewer asked whether the large number of attractive guys meant that there were more female fans than male. KobaP responded that around 70% of the people purchasing the game are male. Although the live events and stage plays are overwhelmingly dominated by women, there are a lot of men playing the games too. Even within Capcom there are people who don't realise this. Decisions such as making the characters handsome and avoiding the use of blood are so that the games can appeal to people of all ages, including women, rather than because the team is directly targeting women. There are also characters who aren't good-looking such as Shimazu Yoshihiro and Xavi. When the first Sengoku Basara did well it got the attention of female fans. The 'Rekijo Boom' (the rise of women with a deep interest in history) expanded and there was more coverage, even on television. Although the team was delighted by this reaction, they were also worried about the risk that it would alienate the male fans. They have produced a great deal of merchandise for the series but they've never made things like cosmetics or underwear for women. They avoid going too far with the 'Sengoku Basara = Women' imagery for the sake of the male fans. The interviewer joked that if they did release that kind of merchandise, it would probably sell. While KobaP agreed he thought that it was better to focus on the series' long term prospects instead of making money in the short term. They summarised the recent tourism campaigns they've organised with local governments in regions such as Kouchi and Koufu. KobaP considers July 2016 the official end of the tenth anniversary celebrations. I hope we'll get more solid news about the new game soon. There's a newsletter due for fan club members in the first week of March which promises to include an interview with directors YamamotoD and Tanaka and information about Sengoku Basara: Sanada Yukimura-den, and there's also the Basara Matsuri event which takes place on the first weekend of the month which is guaranteed to incorporate discussions about what we can expect. After all of this waiting, we should know a lot more very soon. 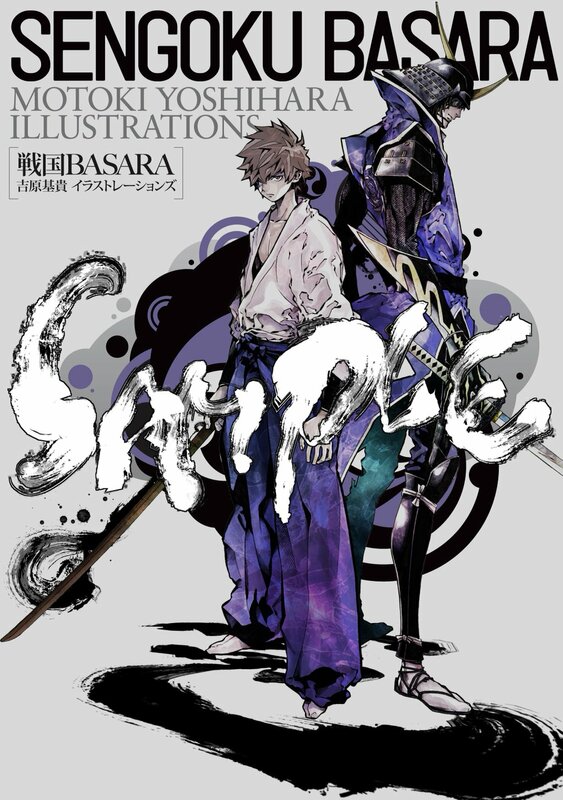 Fans of Yoshihara Motoki's Sengoku Basara 4 manga adaptations will be pleased to know that an art book is on the way this spring. 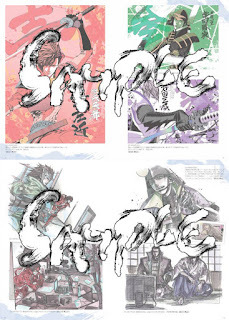 Sengoku Basara Motoki Yoshihara Illustrations will contain cleaned-up versions of those awesome pictures we've been seeing on Twitter over the last few months. The Game No Dengeki Kanshamatsuri 2016, Dengeki Comic Matsuri 2016 and Dengeki Bunko Haru No Saiten 2016 events on 13th March 2016 will be offering the book ahead of its official release and a bonus is planned for those who purchase there. The rest of us will have to make do with regular mail order shops. 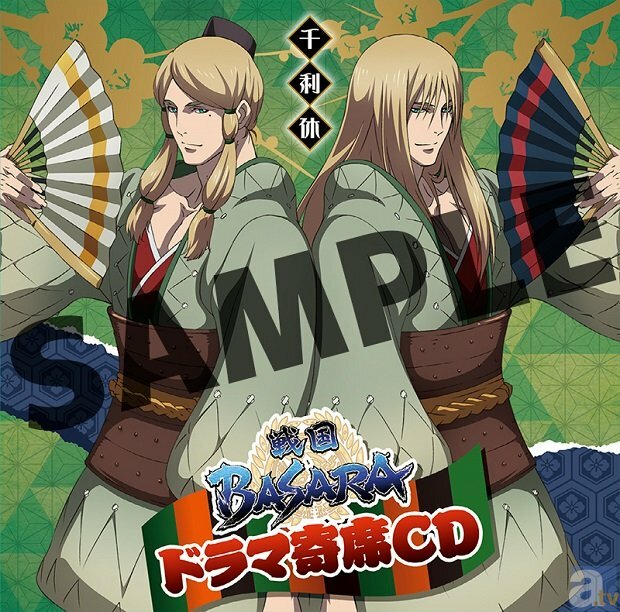 The third and (for now) final CD in the current series, Drama Yose CD Sengoku Basara -Sen No Rikyuu-, is being released this week in Japan. Accordingly, Animate TV have posted their usual preview article now with the cover artwork. 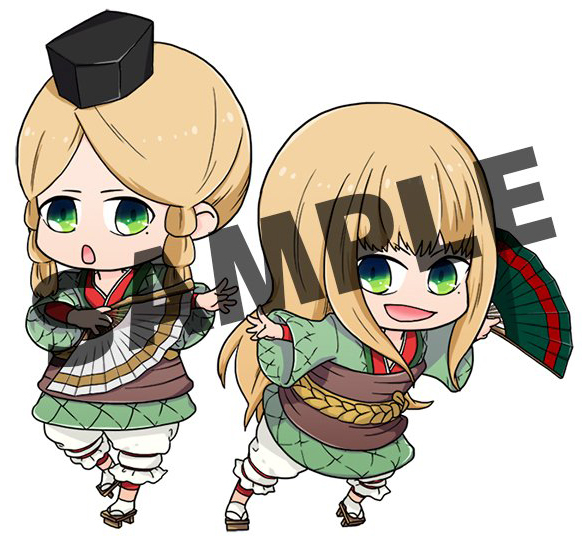 There's also a preview for the Animate-exclusive acrylic keychain which comes with the CD. 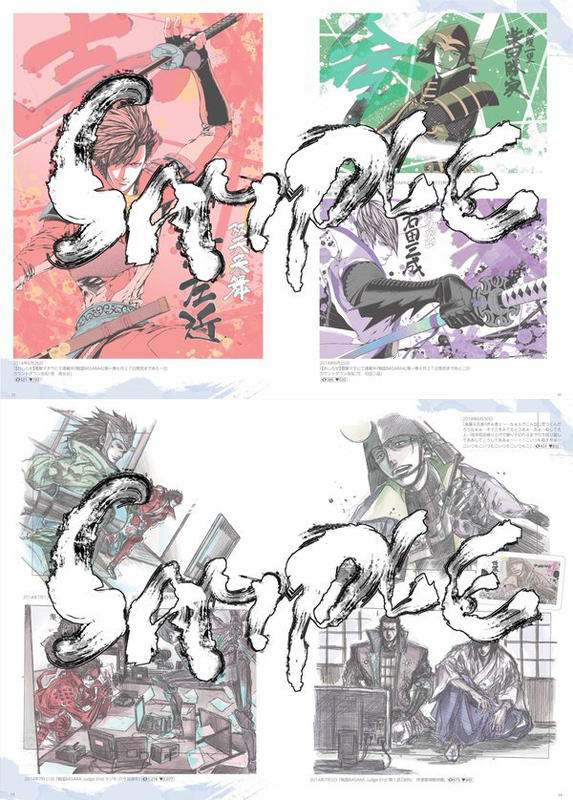 The listing for the first press special edition of the Butai Sengoku Basara 4 Sumeragi DVD went up on the official Ace Shop more quickly than usual, almost right after the show finished its run. The set is priced at ¥7,000 plus ¥500 for domestic shipping, and comprises two DVDs including the 160-minute show itself (filmed on the last day of the Tokyo performances) and 120 minutes of bonus footage. The first press bonus is a photo booklet. The audio is Japanese only and there are no translated subtitles. According to the listing, the extras will include footage from the curtain call of the grand finale in Osaka, a digest clip from the candid 'talk show' sessions with the actors and cast interviews. The DVD sets are expected to ship out in late April 2016 and all specification details are subject to change. There's still no word on a proper wide release for the recent stage plays, sadly; even though several foreign fans made the trip to see the live show the discs are still being treated as a Japan-only release. A few other pieces of leftover merchandise are also available from the Ace Shop for the benefit of fans who couldn't make it to the theatres in person. So, Yukimura wasn't so famous before? Interesting. I heard that too, that Yukimura wasn't as beautiful as they picture him in anime and videogames. I guess as long as he officially denies the Xavi connection he can keep parodying religion without anyone getting upset, but yeah, it wasn't a very convincing lie (lol). Well damn Motoki Yoshihara has nice art, this is tempting. Although the sketchy sketches that he shows on his Twitter are the most energetic imo. Hanbee lipgloss would be perfect. And suitable for both men and women, in canon.